One month ago, Alistair Overeem checked in as a -170 odds-on favorite to beat Brock Lesnar in his eagerly-anticipated UFC debut. Lesnar (Pictured), on the other hand, was pegged as a +140 longshot in their heavyweight affair. However, as showtime steadily approaches, the news surrounding Overeem’s pre-fight drug tests, rumors regarding his unsuccessful stint at Xtreme Couture and questions concerning who he’s recruited to assist him with his training in Holland have caused the Gambling Gods to rethink their lines. 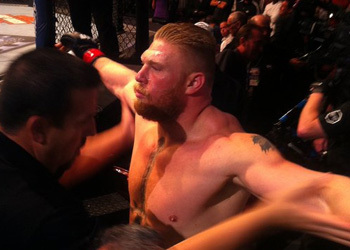 The former Strikeforce champion has dropped to a -155 favorite, while Lesnar moved to a being +125 underdog. The 265-pound shootout goes down December 30th inside the MGM Grand Garden Arena in Las Vegas, Nevada. The victor advances to challenge Junior dos Santos for his freshly-minted title in their next outing.